Hey gang! 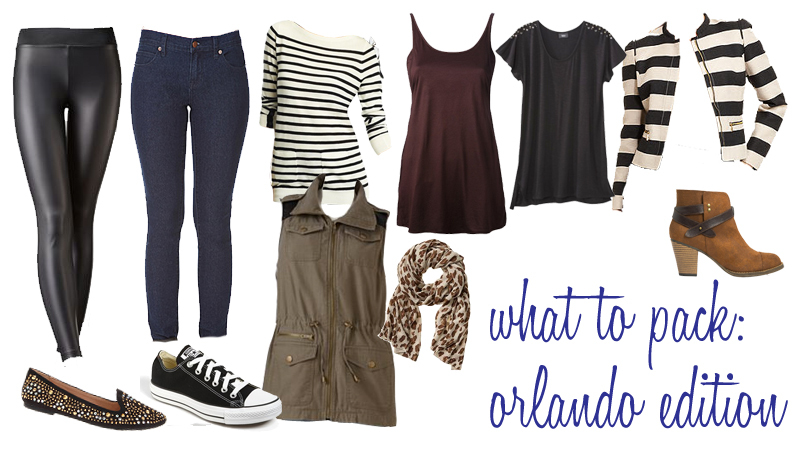 I'm back from a weekend in Orlando so that means...time for another What to Pack post! An amusement park vacation is tricky - especially this time of year, as Florida is not participating in our winter weather. I had quite a time trying to decide what to wear! Do I just wear fall clothes with booty shorts? Do I wear a tropical print sweater?? And on top of all of that, it has to be SUPER comfortable. I think I managed a pretty good line up though, and was never once without anything to wear. So this time around, I opted for mostly neutrals and played with patterns instead of color. 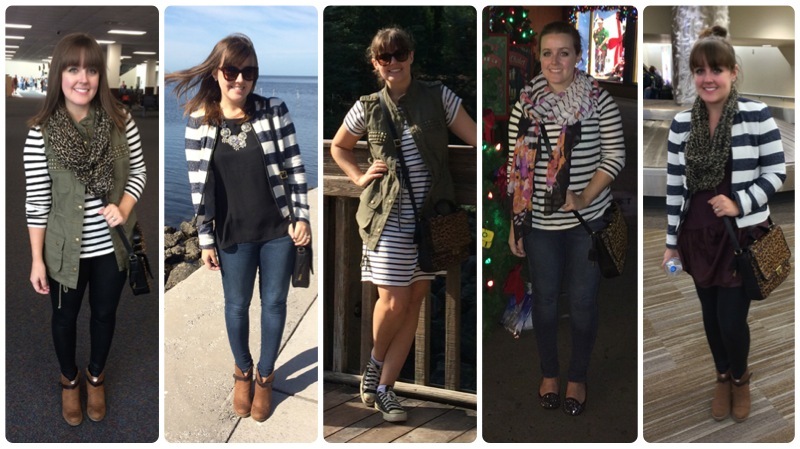 I used scarves and statement necklaces to add a little zing to casual outfits. I also packed three pairs of shoes - probably more than I technically needed, but it was nice to change out of the chucks after a day at the park into different flats. The studded loafers also helped dress up my outfits for night. All in all, it was a fun trip, and I had no problem finding something appropriate to wear. It was a pretty casual weekend, but you could easily throw in a dress or some heels to dress up with this group. The last day did get a little "bottom of the suitcase" with all of the patterns going on up there, but a girl in the airport complimented my outfit so I must not have looked like a total crazy person. Plus, most other people were wearing sweatpants soooooo.....I was practically in a prom dress. I might try to fit in one more "What to Pack" this year with holiday packing, but that's literally next week! Eek!